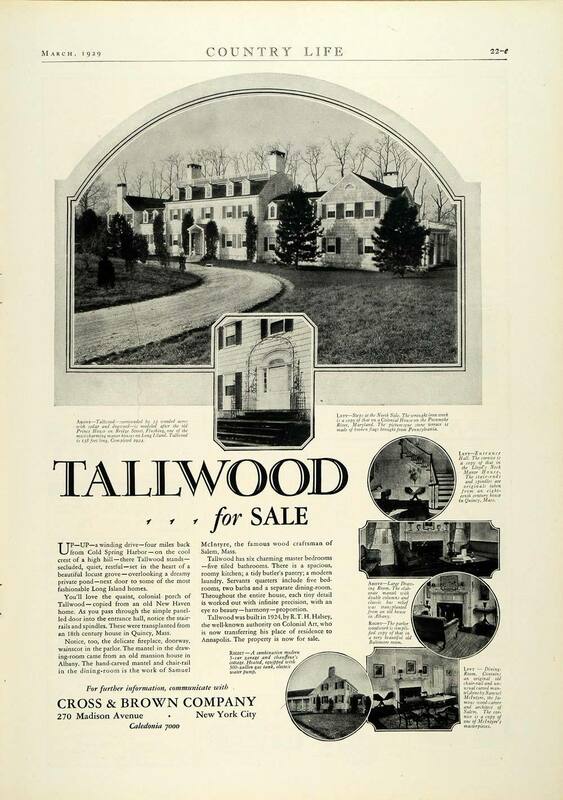 A 1929 advertisement for 'Tallwood', the Richard Townley Haines Halsey estate built c. 1924 in Cold Spring Harbor. Halsey was a partner in the brokerage firm of Tefft, Halsey & Co., trustee at the Metropolitan Museum of Art and co-author with his wife of The Homes of Our Ancestors: As Shown in the American Wing of the Metropolitan Museum of Art, 1925. The home is now part of the West Hills Day Camp. 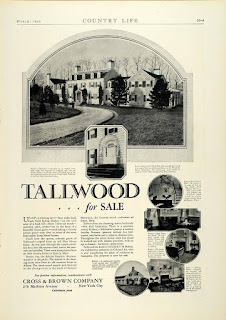 Click HERE to see 'Tallwood' on google earth and HERE on bing. Well I'll be darned. Homes of our ancestors us up on my bookshelf forever. Who would have guessed. Thats funny..my dad worked for Cross and Brown, back in the day. the usual dumb question from the country - did they sell it after only 5 years because he lost all his money in the crash or was it marital difficulties? also, it always irks me that they tear down the iconic quirky ones and the formulaic ones survive. this is just another big house with two flankers. i'll take the Norman village Wheatly type - same formula but way bigger and with that great courtyard and all the encircling outbuildings. your own little French provincial town without all those annoying grumbling Frenchmen. Good to hear from you TPR.